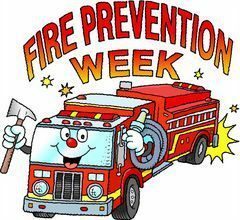 Fire Prevention Week – fire drills at school, visits from Firefighters and Sparky the Fire Dog and “Touch A Truck” events and open houses. Fun for the kids, and they learn important lessons. But what about mom and dad? Do you take the time to review what comes home with the kids? Are there fire drills at work? Hands on fire extinguisher training? Handouts and reminders? Did you know that from the time a smoke alarm sounds in your home, you may have less than two minutes to get out! During the first 90 seconds after the fire starts, the smoke alarm activates. The odds of escaping decrease quickly as flashover can occur in three to five minutes after the fire starts. That’s 1 to 3 minutes after the smoke alarm sounds! Visit https://homefiresprinkler.org/to see the video! As a firefighter and a parent, I understand the important of parent involvement in disaster preparedness. When school sends materials home about fire safety, take the time to review the information with your family. Draw the little picture of your house and identify two ways out. And then practice them. Have a meeting spot. And go there. Take the fire safety checklist and look around the house, you might be surprised. And test the smoke alarm. And don’t forget to review things as the kids grow and the family changes. When we moved from the city to the farm, we had to change our meeting place. The neighbor’s house was a 1/8thof the mile away through the corn field. And as the kids grew, the escape ladder was moved from the master bedroom to the kids’ room – they could now set it up and use it without help. Other changes in family dynamics include disabilities and the elderly. There is no way my mother could climb out a window and down an escape ladder. Fortunately, she has a single floor condo, but I have friends whose parents live with them. My final comment for today, consider a home fire sprinkler system. They are a cost-effective life saving device.